Search Engine Optimisation - (SEO) is the art form of getting a website on the 1st page of Google for relevant search terms potential customers might be searching for.Search Engine Optimisation SEO will increase your website’s ranking on search engines for keywords and phrases that are relevant to your business. Search Engine Optimisation - (SEO) typically includes keyword research and development, seo meta tags optimisation, seo linking strategy and seo implementation, website submission and seo ranking results reporting. Crank IT’s experience in Search Engine Optimisation (SEO) is unrivalled. Over the year’s our network has optimised 100’s of websites with a 99% success rate, this is something we are very proud of. We are now so confident will the results our SEO clients receive, our SEO Team wont accept the final payment for the SEO process until your website is ranking on the 1st page for one of your selected keywords within 3 months. By doing this way we also have an interest in seeing your website rank. 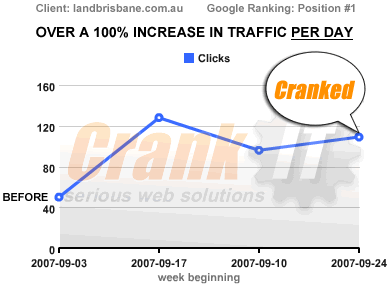 This is one of the many things we have put in place to maintain SEO integrity and online success at Crank IT. View our recent SEO clients search engine rankings on Google.